If there is one gadget that garners more speculation and rumors than any other it’s the Apple iPhone. Ever launch so far has seen a marked improvement on the last, which leads people to wonder “what comes next?”. Thankfully we can often find some base for the rumors. Sure many flying around are simply little more than wishlisting by users, but many more are based on sound facts – information from suppliers, insider leaks and more. With that in mind we have pieced together the most likely iPhone 5 rumors that are doing the rounds at the moment. Something to whet your appetite ahead of any official iPhone 5 announcement’s from Apple. + A larger screen. Seemingly the most accurate of all the iPhone 5 rumors. Phones have been growing in size for years, indeed it was Apple that started this trend. 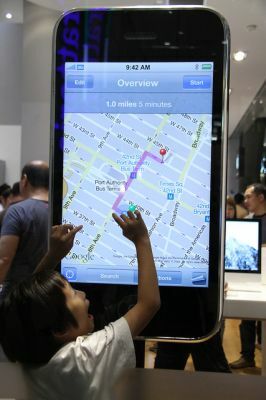 To compete with many phones that offer a larger size (and so a larger display screen) Apple feel they need to grow the phone to compete. Until now the iPhone has always had a 3.5 inch display. But following leaks from component manufacturers it is thought that Apple will be increasing it to a hefty 4 inches (still somewhat off the huge 5.3 inch display from the Samsung Note). + October Release. Issues with component manufacturers have set Apple back. But it seems that manufacture is being geared up for an October release, a traditional release date for Apple anyway – the latest version, the iPhone 4S, was released in October. + Steve Jobs Design? Rumours are suggesting that the iPhone 5 is the last in designs from the late Steve Jobs. He had, we are told, already planned for a larger iPhone and this is to be the fruits of his labors. + IOS 6 to be revealed in June. WWDC, Apple’s WorldWide Developer Conference, is set to unveil the latest operating system for the iPhone, which will pave the way for the iPhone 5 by getting the operating system into general release ahead of it’s launch. + LTE/4G support. We have already seen the iPad 3 released with LTE/4G support (though it has been limited in it’s marketing of such), it is widely expected this will extend to the next version of the iPhone. iOSBeta.co offers the fastest, most secure UDID Registration on the web! We offer super fast, super secure, registration of your UDID. We register your UDID in just a few minutes! Of course there are many other rumors that are doing the rounds. Liquid metals to replace normal metals to increase the strength of components. Stronger screens, increased processing power and more are all likely rumors that are doing the rounds. Expect more to be growing until the smart phone’s release.